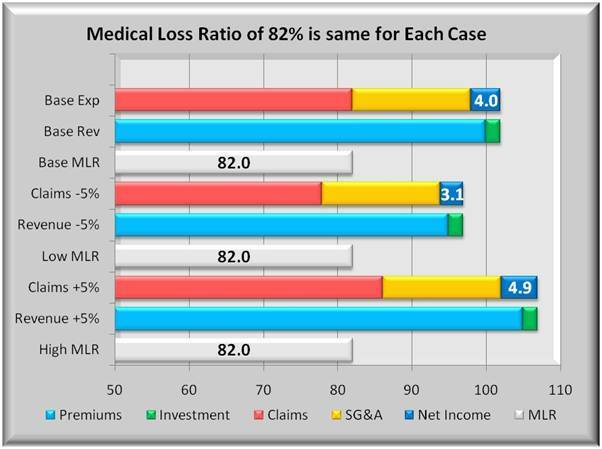 Health insurance companies have repeatedly claimed their earnings were a very modest 3-5% return on sales. Implicit in their claim is that many others earn far greater returns. But comparing sales ratios to other industries can be misleading. 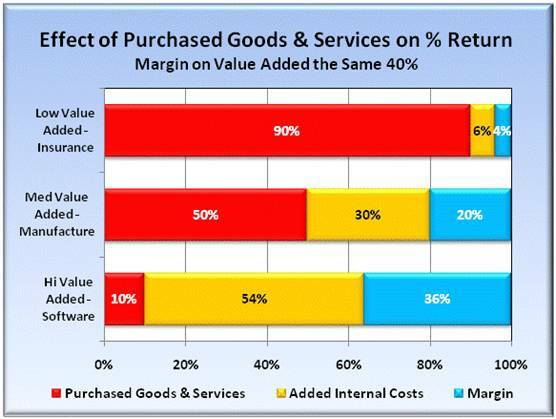 High value added industries like software have high sales margins. Low value added industries like groceries and insurance and have low sales margins. While health insurers may not compare well with the high valued group, they show very fair returns compared with lower added value industries. 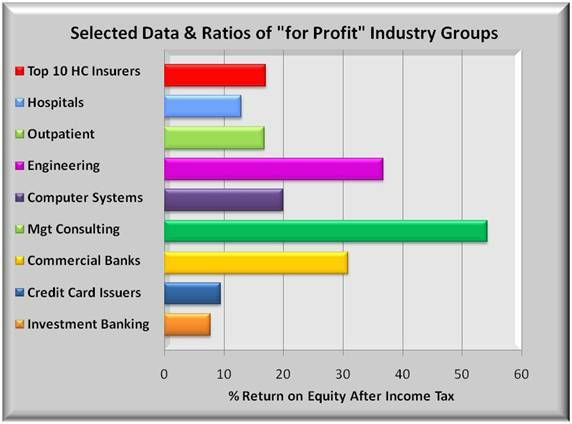 Other financial ratios used to compare include ROI and ROE that key not on sales but on gross and net investment. How much money was used to generate profits. 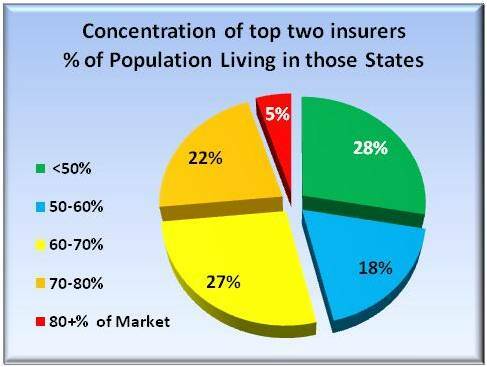 Here the picture is significantly more favorable for health insurers. They are not only near the top of basic industries, but are well positioned compared with more discretionary industries. Return on sales, while prevalent, is not the only financial ration used to compare performance. Each ratio has its strengths and weaknesses. The weakness of return on sales is that it completely obscures the differences in the value companies add to the goods and services that they sell. 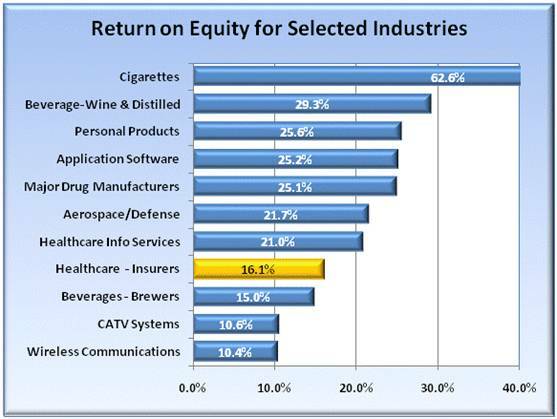 The chart below highlights returns for three industries based on value added. (Ratios are for example only.) The bottom bar represents high value added firms like computer software where purchased goods and services are nominal compared to what they pay their staffs and what they earn on sales. The mid range covers companies like manufacturers who buy raw materials and intermediate goods, perform significant steps (like conversion and assembly) incurring added costs, and (hopefully) sell at a margin above their internal costs. Finally, at top are industries where the bulk of their costs are purchased, like groceries and insurance, and while they add value it is small compared to their purchase costs. In all three cases, a consistent ratio of internal costs of 60% and margin of 40% was applied. But notice that the margin on final sales (at 100%) ranges from 36% for high value added industries to only 4% for low value added. To rely on returns based on sales is meaningful only within industries with similar value added components. Ratios of returns on sales are also influenced by where they stand on a “necessity” scale. Sales for basic items like food, housing, and utilities, tend to be fairly stable and many of their costs are simply “passed through” to the customer. The more the pass through, the lower the markups tend to be. Conversely, purchases discretionary purchases for luxuries, entertainment, and cell phones can be expected to have higher margins. Sales levels are more affected by economic conditions and higher margins compensate for greater risks. 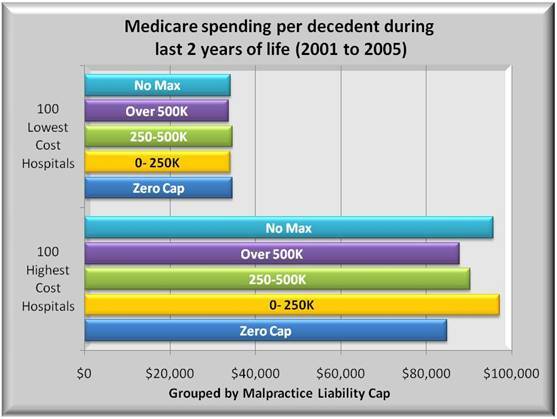 As noted, health insurers act like the poor kid on the block using net profits on sales. 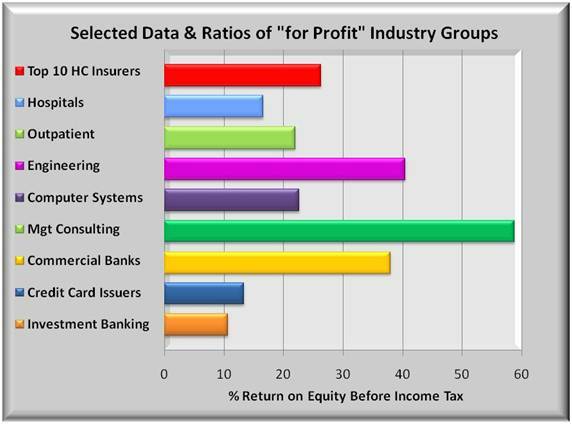 It is true that a group of industries have far better returns than health insurers as shown below. 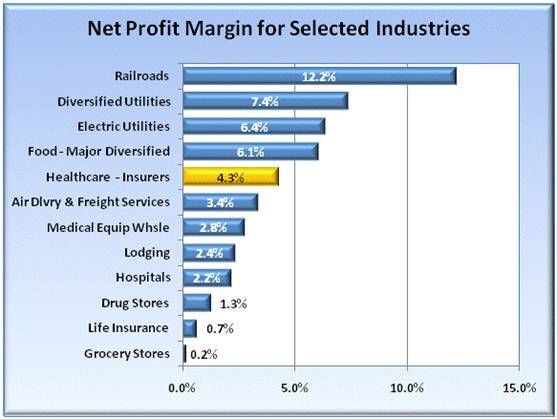 The chart shows returns based on net profit margins divided by sales (Source: Yahoo Finance – Industry Index by Sector). Insurers ARE the “poor kids on this block.” But look at the “block.” Cigarettes, beer, wine and liquor, golf clubs and perfume, cell phones and cable TV. These industries can hardly be defined as meeting basic customer needs. These are discretionary purchases that can cut back on during tough times. Purchases of basic necessities are harder to cut back. Below is a different group of industries covering more basic needs. 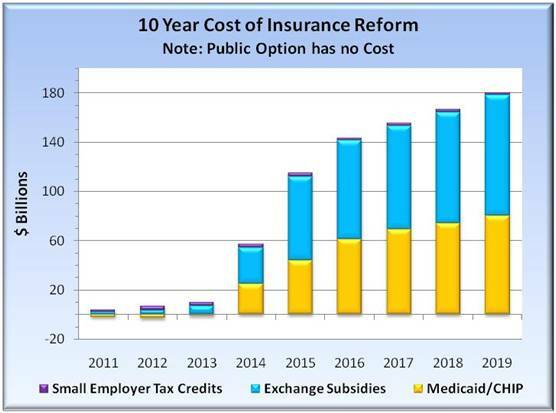 One would reasonably assume that health insurance is a basic industry and where value added is small compared to total costs. 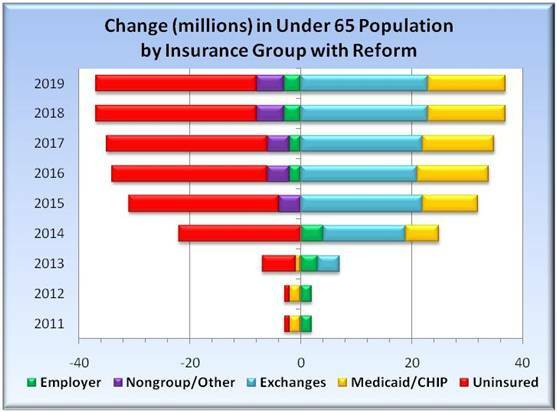 While Health Insurers (gold bar) may not be the highest in this group either, they are by no means the lowest. 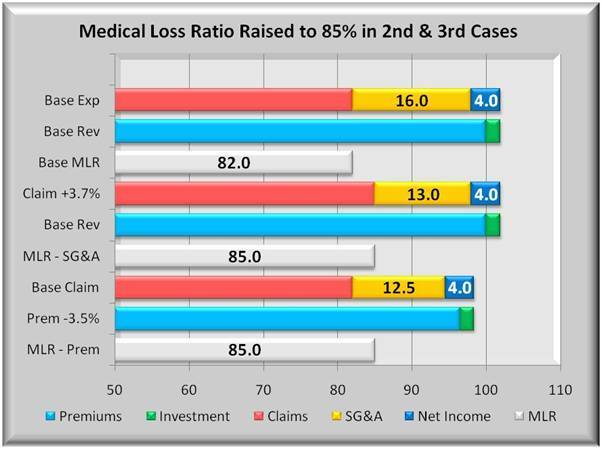 What you don’t see are these other industries complaining about their low returns on sales as health insurers do. With wide swings in returns based on sales revenue, Wall Street uses several other ratios to compare rates of return. One is return on investment (ROI). Buy a CD and earn 2.5%. It’s simple. ROI = 2.5%. Now buy a house. Pay cash and it’s just like a CD. 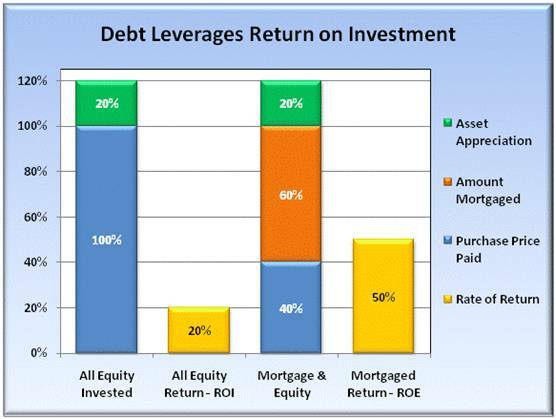 But if you take out a mortgage, you have leveraged your returns. Your house will change value the same regardless of how much equity you have invested. But your Return on equity investment (ROE) is different. The chart below shows how this works. Assume you buy a house and take out a mortgage for 60% of the purchase. A number of years later, you sell the house for 20% more than you paid. If you had paid cash, your return would be 20%. But if you had mortgaged 60%, you put up only 40% cash and your return is a 50% (20% return /40% cash invested). ROE is similar to return on investment (ROI) or assets (ROA) but reflects only the net amount of equity investment. Previously described were two groups of industries, those dealing in basic necessities, and those more in discretionary items. The groups are the same but comparison is different, using the return on equity (ROE) ratio as just described. Wall Street considers returns on equities in the 15-16% to be normal average for all industries. But again the question is whether health insurers should be considered “average” when they satisfy basic needs where lower ROE’s are expected. 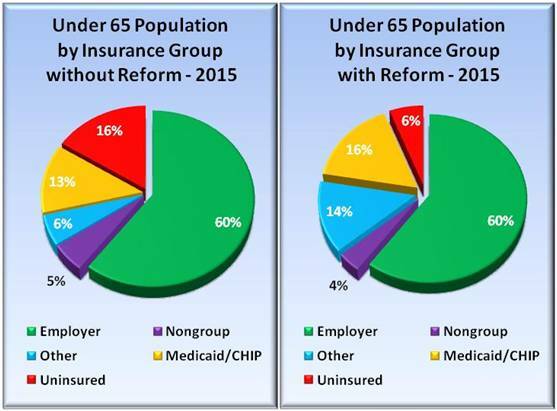 Comparing health insurers with the same group of basic industries shown previously, the picture below dramatically changes. 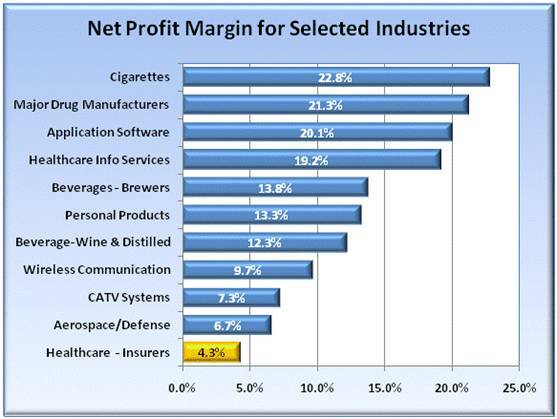 Insurers are near the top of the group with the majority of industries coming in lower. These industries are more suitable comparisons than insurers prefer to use. One final observation. 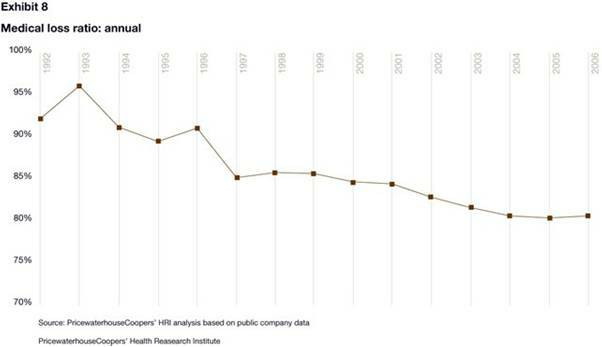 Health insurance used to be heavily non-profit. 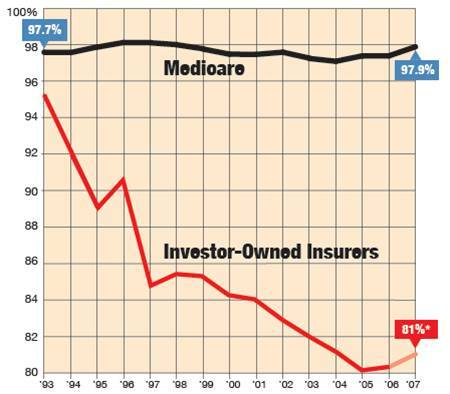 For profit insurers came later as life insurance companies began to diversify into more profitable fields. Now look at the ROE for life insurance: at the bottom. FACT CHECK: In 2009, the percentage of premiums that went towards administrative costs and profits declined for the sixth year in a row and have been consistent for decades. 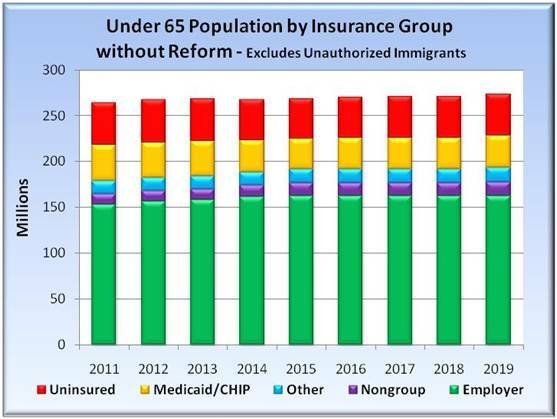 FACT CHECK CHECKED: America’s Health Insurance Plans (AHIP) combines self-insured line of business (LOB) and insured LOB and presents the results as if it were one homogeneous market. Nothing could be further from the truth. Size wise, the ratio of self insured LOB to insured LOB is roughly 58% / 42% of self-insured / insured or underwritten. 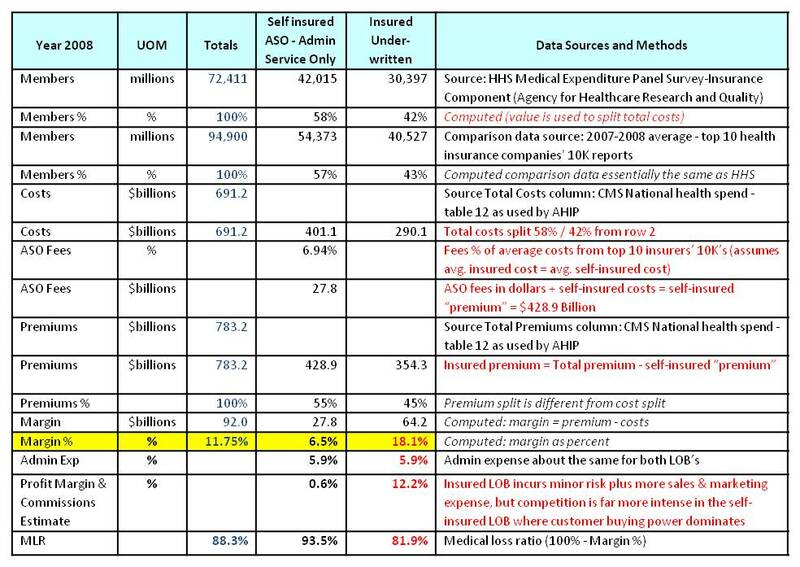 Insurers charge self-insured (ASO – administrative service only) groups an administrative fee that, for the top 10 health insurers, averaged 6.94% of costs. 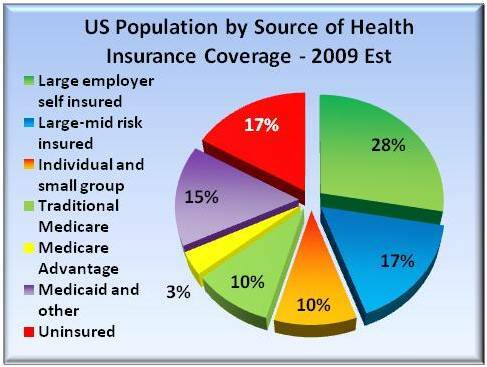 That translates to 6.5% of “premiums” which are really medical benefits plus service fee income. This “efficient” administrative expense is not evident in the insured LOB. To identify the administrative costs and profits for the insured group, one computes and then removes the self-insured revenues and expenses from the CMS Totals as shown in the table below. Sources and stepwise methodology (top to bottom) are shown in the far right column. The claim that insurers’ average percentage of premiums that went towards administrative costs and profits was around 11.75% (and have been consistent for decades) totally obscures two radically different lines of business with divergent expense ratios. 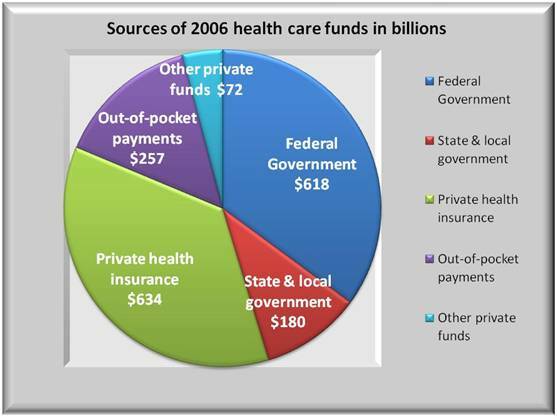 For 2008, self-insured admin costs and profits were about 6.5% for self-insured groups, but about 18% for insured groups. Since the profit margin is VERY slim for the self insured, the bulk of profits are born on the backs of the insured groups which include small business and individuals. 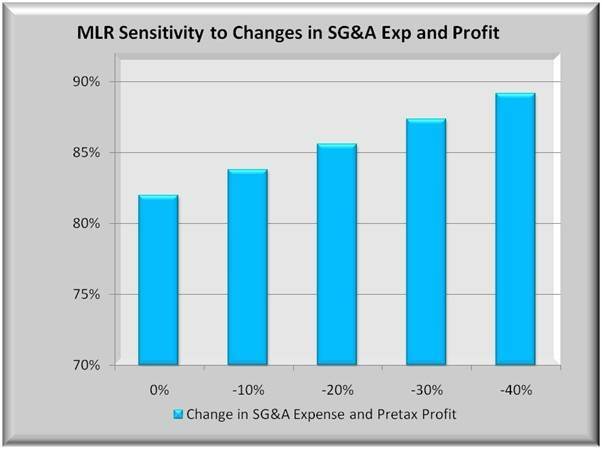 A reasonable question to ask is “why are insurers satisfied with profit margins of well under 1% on 55 % of their business but feel a need to push margins well beyond 10% on 45% of their business?” Though risk is a small factor in the insured LOB, they have to compete far harder on self-insured LOB than on insured LOB where they hold oligopoly power in local market areas and convert that market power into profits. The Top 10 health insurers had revenues of $242.5B. 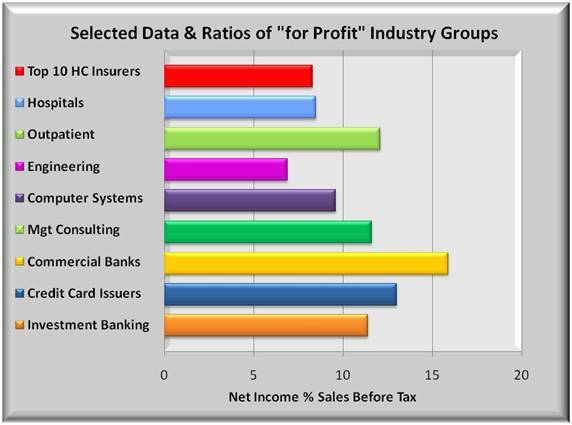 When comparing net income as a % of sales, these insurers ranked lower than other industries as shown in the first two graphs below. The top 10 are in red below. The Top 10 pay a higher % in taxes so their before tax ratio is slightly better (upper left graph) than after tax ratio (upper right graph.) But is % of sales a proper comparison across industries? 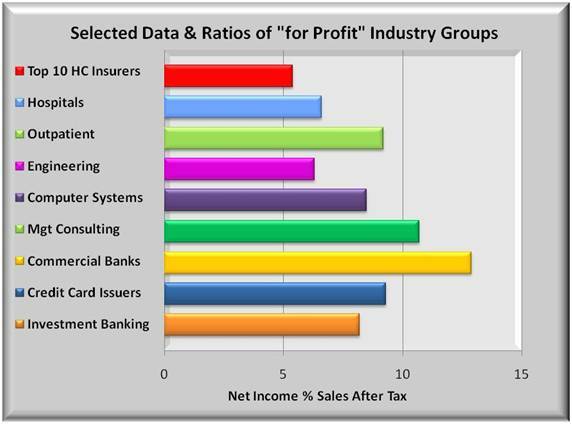 Higher revenue industries all tend to have lower Income as a % of sales than do lower revenue industries. Rather than dividing net income by sales, one can divide net income by equity. Equity is how much shareholders’ money is invested in the business. It takes into account loans. And it puts firms of different size on a more equal footing. Return on equity or ROE is a recognized way for comparing companies in different industries. The two lowest graphs show average ROE for the Top 10 compared to 8 industries. Though not the highest before/after tax, Top 10 returns exceed hospitals, outpatient care centers, computer systems design, credit card issuers and investment bankers. Returns trail highly profitable, engineering, management consulting, commercial banking, and physicians and lawyers (not shown). 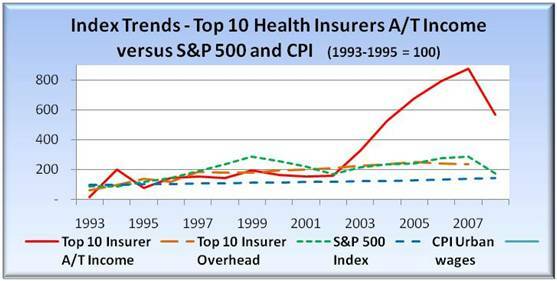 In summary, health insurers are fairly profitable enterprises as currently structured. But some ask whether at least part of that profitability is derived from questionable denials of claims made by their subscribers.